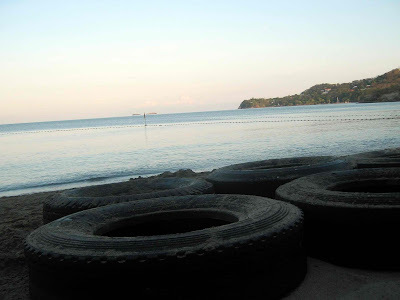 November 2011 | To Be, To Be. Tutubi. 1. Running at QC Memorial circle. 2. Taking pictures while warming up. 3. Riding the Pagoda at the Pedal and Paddle attraction at the park. 4. Seeing a koi pond inside the park. I love koi ponds! 5. Pandesal, coffee and pansit canton, and eating all these while sweaty and smelly, and still laughing and enjoying! 6. Visiting our Montalban house after two months and finding it dirty, with a dead animal pushed through the gates and the water service disconnected, neighbors go out of their way to help us out by offering water. Sweet. 7. Still feeling happy and content once the house was cleaned up! 8. Watching Ang Babae sa Septic Tank. 9. The vendor who sells merienda. 10. Palabok and turon and biko for merienda! 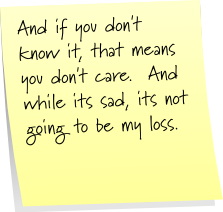 If I think about it more, I really have a lot of reasons to be happy! Family, good health and simple joys make my life complete! 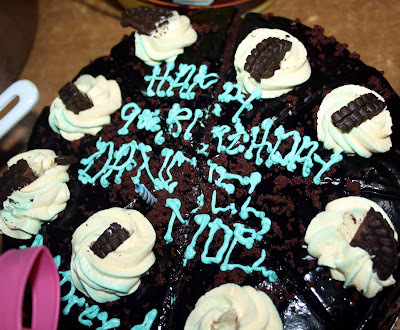 My son, Danniel turned 9 years old last November 24 and we had a simple birthday dinner for him. We cooked one his favorite dishes, this Pininyahang Manok which was such a hit with the kids and adults. 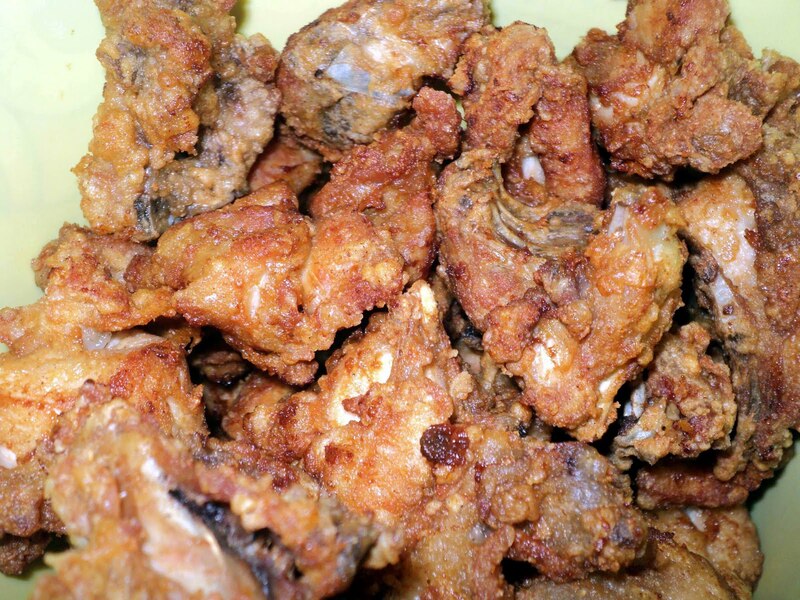 And of course, everybody's favorite fried chicken! 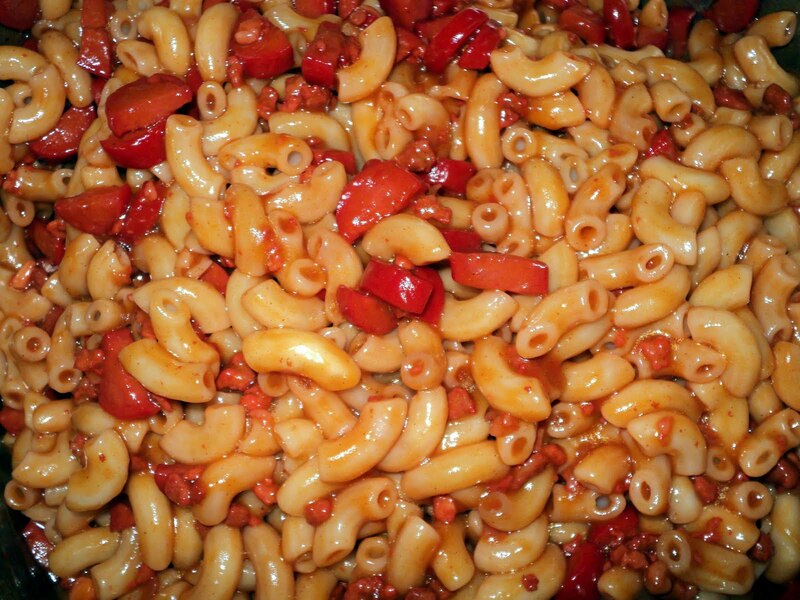 And while the birthday boy does not eat anything with tomato sauce of ketchup, we all love this macaroni with hotdog and minced meat! It was such a hit that my eldest is already asking if we can have this for noche buena. And this is our simple chocolate cake for the birthday boy. And here is Danniel while we were all singing a happy birthday to him! It was just a simple family dinner to celebrate the birthday of my son. I am so lucky that my son is already very happy with it and did not ask for a big party or anything! I am the wealthiest person in the whole world and here is my wealth! They are the most important people in my life and the only ones that matter, plus my mother and sisters. And for thanksgiving, they are the reason why I am most thankful! The most important things in life are family and good health and I am happy that I have them in my life. What else can a wealthiest person in the world ask for? To the sweetest son a mom could ever have, my son Danniel Noel, Happy 9th Birthday today! I love you very much! My husband and I are on leave from work today because Danniel decided he will be absent from school. So our gift to him is to spend this whole day with him. We will have a simple family dinner later and we have already gone to mass this morning after bringing his siblings to school. 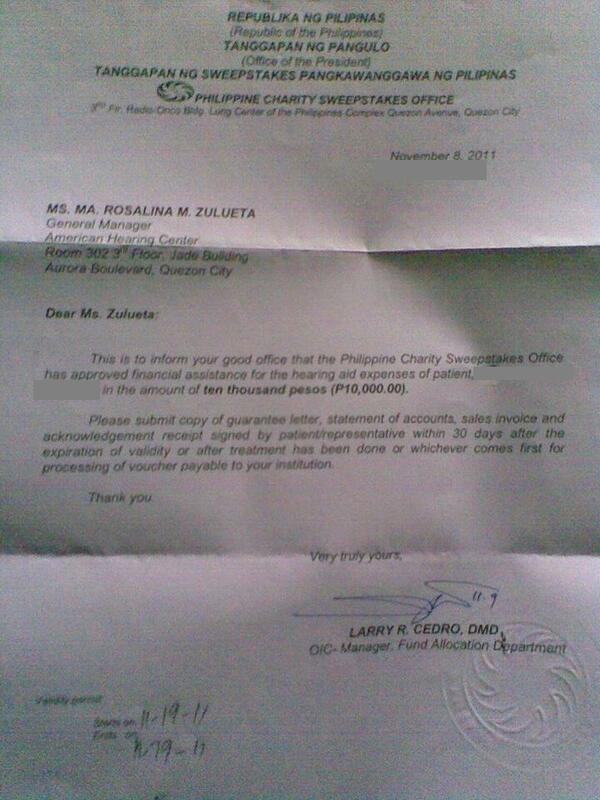 As I type this, Danniel and his dad are in Greenhills, having his PSP repaired. I just got back from the market for the dishes we will cook for later. Earlier, I asked him if he preferred having gifts and money but daddy and mommy have to work abroad or just like now, with just about enough and he said this is okay, as long as we are complete. Aww, that is such a heartwarming thought. I actually do not have a gift for him yet but I am planning on getting him a replacement stuffed turtle toy tomorrow. I just love how Danniel has turned out from a small boy to the kid he is now, such a sweet boy with such happy disposition! What more can a mom ask for? 1. Free Breaking Dawn advance screening ticket. And the movie was good too. 2. My mom, for making coffee for me every morning. Makes you feel extra loved! 3. Extra hugs and kisses from my kids before they go to school and before they go to sleep. This is what its all about. 4. Paypal money for my kindle fund. 5. Danniel for being Top 4 from Top 8 last quarter. 6. Ishi for being Top 10 this quarter. She wasn't in the list last quarter so I am so happy she made it this time! 7. Peanut butter and white coffee. 8. Artemis Fowl and my Apad. Because I cant use my laptop at home, I use my Apad to read. 9. The looming 13th month pay so I can already pay my loans and debt-free for half a month, haha! 10. Knowing that my kids would rather have simple things in their life, as long as we are together as a family. 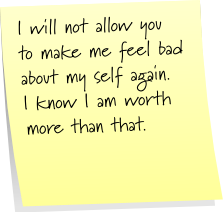 My eldest told me this just the other day, out of nowhere, and I am so touched! This is something that makes me extra happy because while I really am thinking of working abroad, I now know that my kids are willing to make the sacrifice for as long as our family is together. I availed of this one-hour massage package from Xquizite Spa being offered at Metrodeal for an amazing deal of P125 only from the original P250 price. It was so cheap I bought two vouchers which I intended to give to my husband. When we get there, there was a therapist lying on the sofa at the reception area. This did not bode well for the kind of service that they will provide but I wasn't really expecting much from such a cheap deal. I only reserved a slot for my husband but I asked if I can use the other voucher for myself. They refused at first and when I said its okay, they said that they can accommodate me. My first impression of the spa was that it was too dark. The aircon unit was directly above the signage at the reception area. And then when we were going up to the massage room, it felt like we were actors from a D-movie going up to some sleazy motel room. I am not so sure but I think they were using incandescent bulbs. The rest room looks okay but there was no toilet paper and no sink and no mirror. Then we were ushered into this room separated by a curtain and then we were asked to undress. They have no robe and there was only this threadbare towel. When I was asked to lie down on this pillow, I just couldn't put my face on it. I took a picture below just in case you cant figure out why! 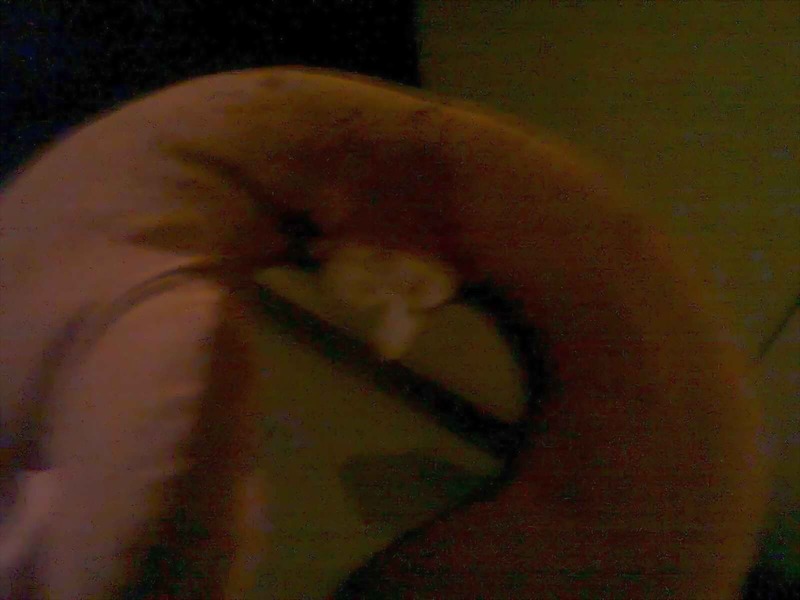 The pillow was thread bare and it was so old the filling was spilling out already! I put my jacket over the pillow so I can put down my face. Thankfully, the massage itself was okay, thanks to my therapist Theresa. She didn't ask me how I wanted it so the massage was hard at first but when I told her to keep it a little light, it was okay from beginning till the end. Unfortunately, there was no music in the spa and you can hear the sounds of jeepneys and other vehicles plying Shaw Blvd! You really can't enjoy the massage because you can't relax while hearing all those sounds! Another thing, the therapists didnt appear to have lockers of their own because Theresa brought her bag with her. At first I thought she was going home already! 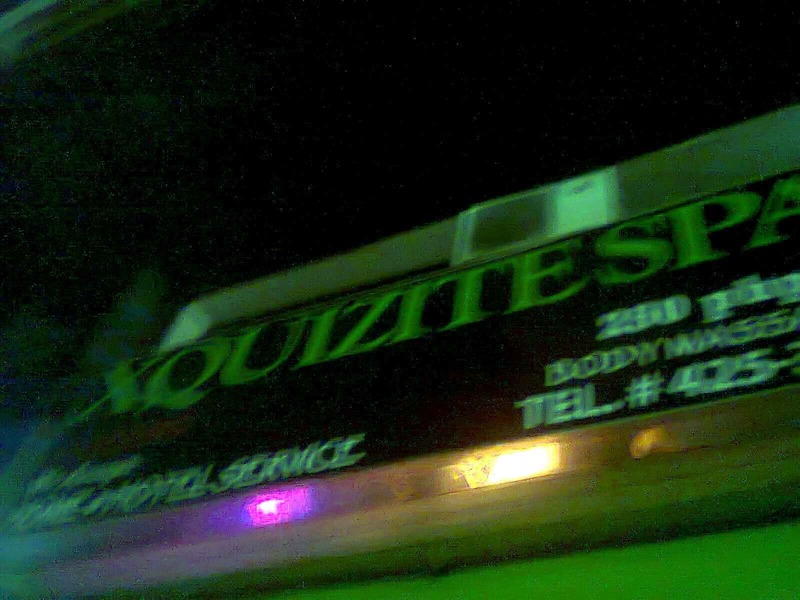 So, my personal experience at Xquizite Spa was not that exquisite. And you can say that for the price of P125, I did get what I paid for: a cheap massage and nothing more. But again, that's just me. Maybe your experience will be a more enjoyable one. This short film from GMA Shirt Film festival for this year made me cry. I saw this just now and I thought to share. So touching! I Am Attending Bella and Edward's Wedding Tonight! Look what my angel has brought me just minutes ago! Free tickets to the advance screening of Breaking Dawn Part 1! Thanks Ms Joan! Totally unexpected and much appreciated! 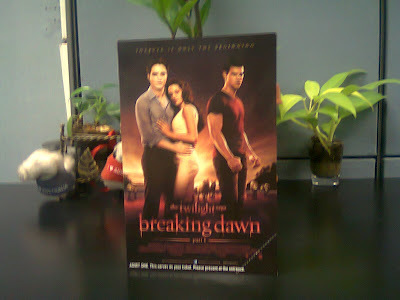 My friend Vangie, who is more of a Twilight fan(am a Harry Potter fan, through and through) will be with me. Am too excited! 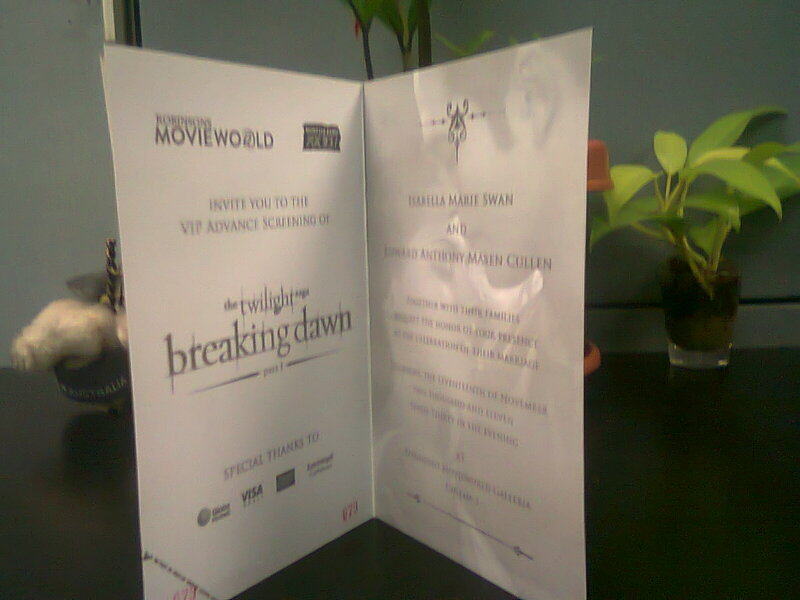 Wow, that is two advance screening in a year, first the Harry Potter IMAX press screening, and now Breaking Dawn part 1. I feel so loved! 1. 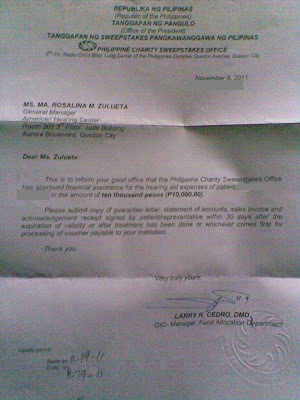 Guarantee letter from PCSO for my mom's hearing aid. 2. 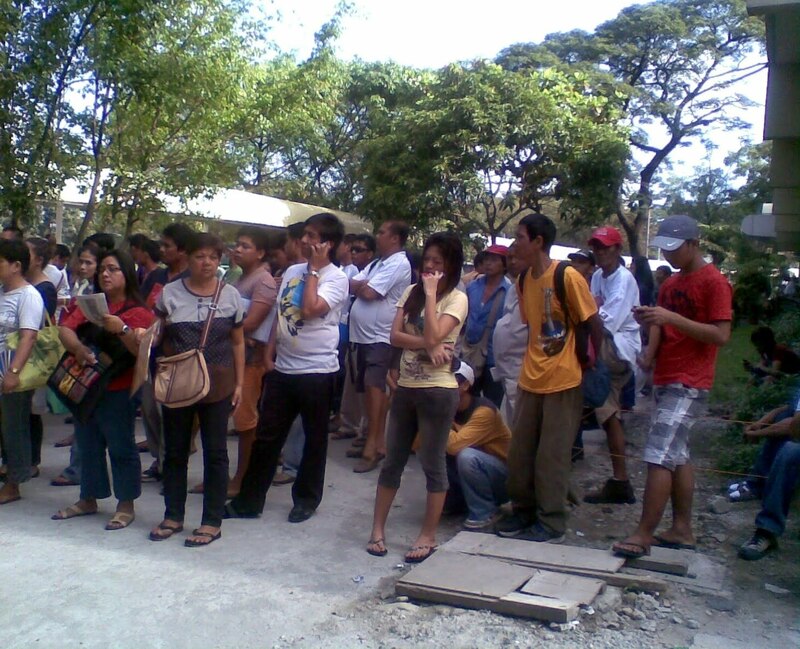 My sister Kris who woke up early, line up and wait while standing for several hours until finally it was granted. 3. A gold necklace with tutubi for a pendant. 4. Hugs and kisses from the kids. 5. Siomai with lots of garlic and chili sauce. 6. Daily 5-km run at the gym. 7. Losing 2 lbs this week, which I will probably gain back again during the weekend. 8. Cheese ring and white coffee for merienda. 9. Hot pandesal with peanut butter. 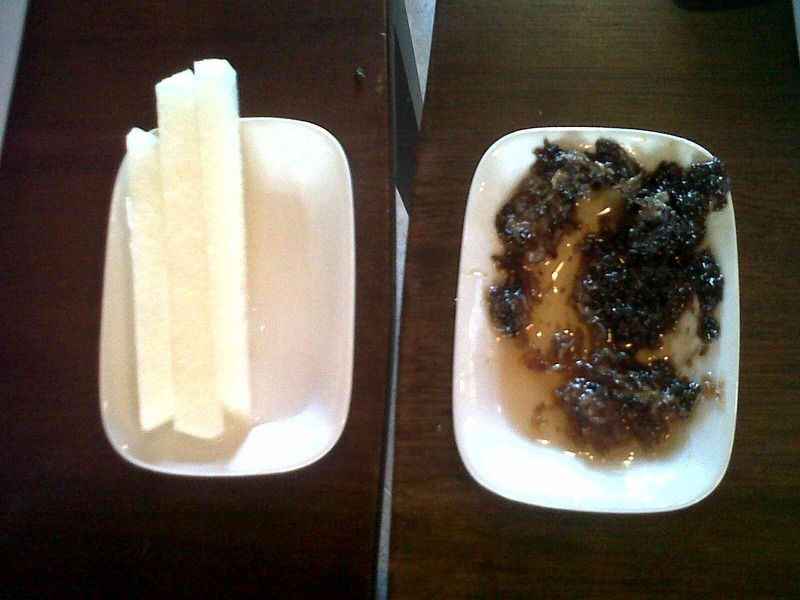 This is a follow up to the post, How To Make Suman (Sumang Dapa) because Latik and suman makes a perfect combination. And if you drink Kapeng Barako while eating this, you will be in heaven! This latik is different from the latik you see as toppings on top of bibingka, which is only coconut milk cooked over low fire. This latik is made up of grated coconut and brown sugar, cooked over low fire and stirred non-stop until dry. The procedure can be seen on the photos below (click for larger image). And if you are wondering why I do not have a picture of the suman and the latik together, its because we always finish it even before I manage to run for my camera. Anyway, just take may word for it that this latik is way better than the other kind which is like coconut caramel. Enjoy! Here are just some of the links for free live online streaming to the Pacquiao vs Marquez fight today. In Batangas, it is common practice to cook suman during Undas or All Souls Day. And since we were going home for a visit, my sister's mother-in-law decided to prepare some suman which she knows the kids absolutely love. We call this suman, sumang dapa and this is how you make it. For this batch, Nanay Meding used 3 salop na malagkit (one salap is approximately 2.3 kilos) and 6 coconuts, grated and milked. The procedure on how to make this is illustrated here for you. It was a very fun and educational experience for me because this was the first time that I was able to do it and document the process too! We very much love sumang dapa and even though I dont think I can do this in the city where we live because of the process involve, it is good to know that I can do it if I want to! 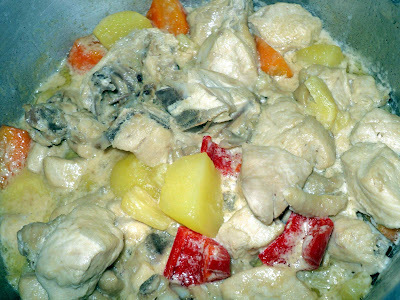 Next post would be How to Make Latik, that dressing which goes well with the sumang dapa! Check out Cebu Pacific's latest seat sale for 11-11-11! P11 for all destinations! Happy fare hunting! 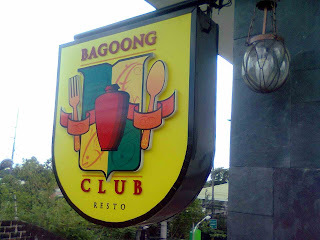 Kung iisipin, lahat ng mga patapong bagay ay may pakinabang pa. Katulad halimbawa ng mga gulong na ito na nakita ko sa dalampasigan ng Matabungkay nuong isang taon. Ginagamit siya sa team building bilang obstacle course. Mabuti na lamang at na-recycle sila. Isipin mo na lamang na hindi siya nabubulok at magtatagal sa ating mundo ng mahabang panahon. Sa ganitong paraan, hindi siya basura na masakit sa mata, kundi isang kapaki-pakinabang na bagay! Hindi lamang gulong ang maari nating i-recycle. Sana ay lagi nating isipin bago magtapon ng kung anuman, na baka may iba siyang pakinabang at hindi basura lamang. For every MyOwnPet balloon purchased here, $5 will go directly to help Canines for Disabled Kids. 1. 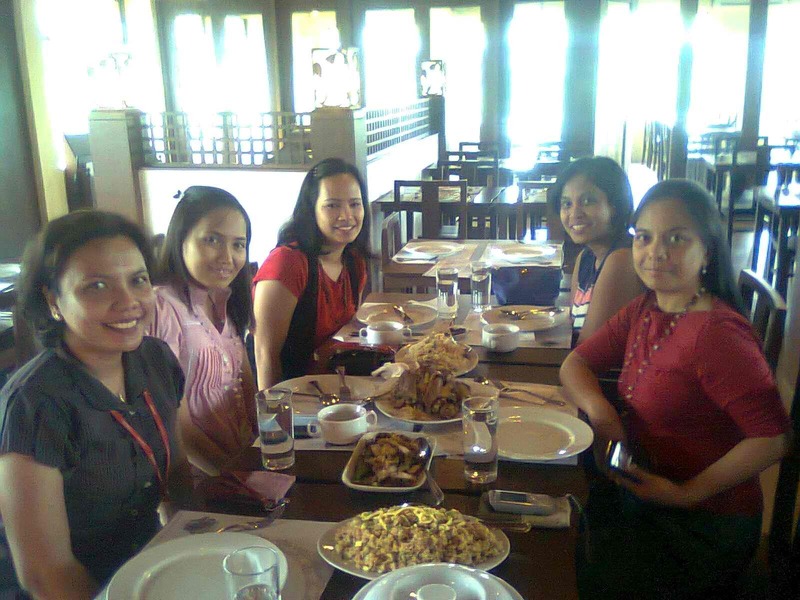 Karen's birthday lunch and Cathy's simple merienda shower. 2. Jheff and Blanda's pasalubong from Naga: puto seko and pili nuts! 3. Angelo's birthday celebration, Ate Melen and Kuya Hal's support and love via webcam and the elder kid's showing their responsibility and maturity. 4. 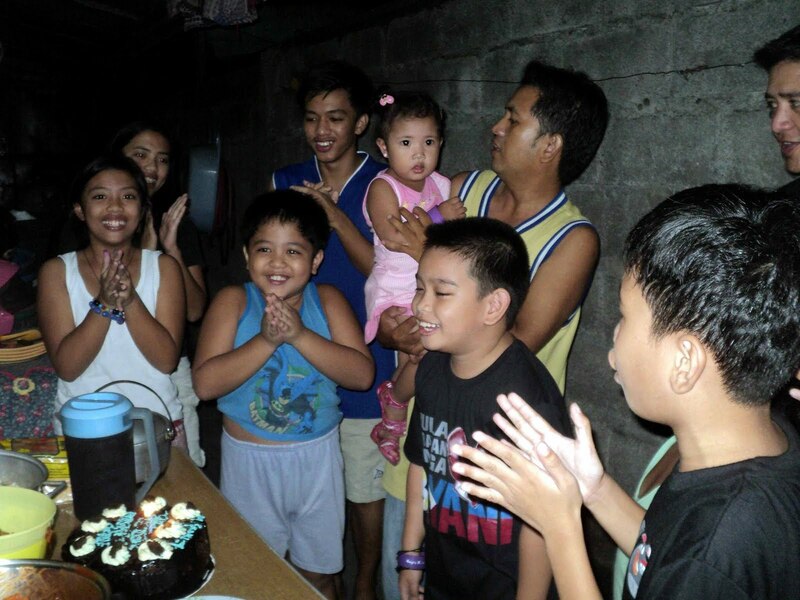 Seeing how a simple pabitin, musical chairs and paluan ng palayok can make a birthday party a hit! 5. Emi's delicious carbonara. Yummy and a sure hit! 6. A killer migraine but loving caregivers aka hubby and kids. 7. Paypal money from a forgotten paid post! Yes, more groupon money for me! 8. Wifi at home at a minimal cost only. 9. 12 days to pay out of more paypal money. 10. Almost good news from the hearing aid front. 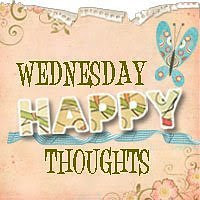 Remember, happiness is a choice so despite difficulties, always choose to be happy! God will always provide. 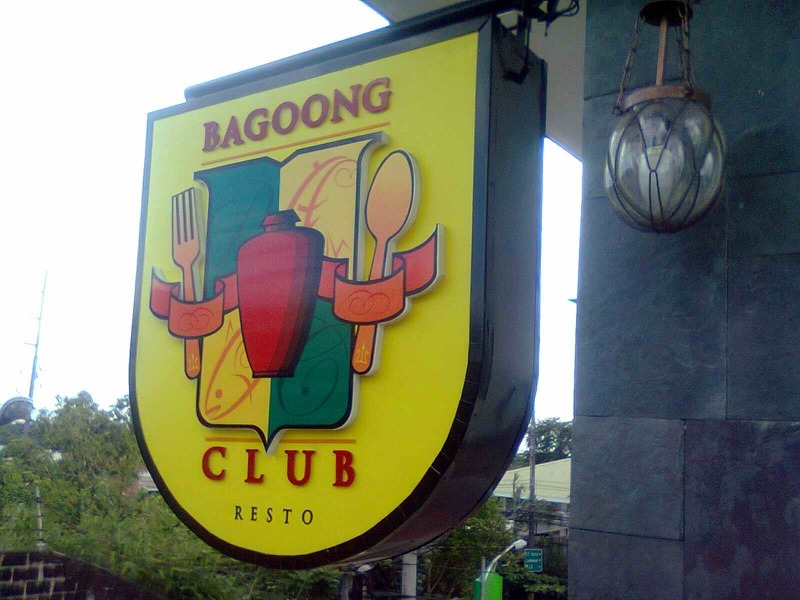 We bought vouchers from Cash Cash Pinoy to avail of the promo at Bagoong Club. My office mates had a nice experience at their QC branch when they went on a field work and so we were excited to try the food this time. 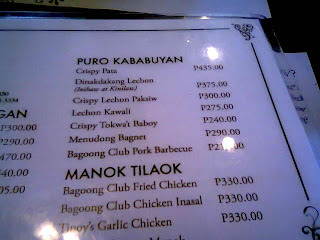 We had 3 vouchers which we bought for P900 and we get to spend P1500 worth of food. While we were waiting for our orders we were given this singkamas with bagoong as appetizer. It was good! We wanted to ask for more, ha ha. The menu was aptly named, ha ha. We had fun choosing our dishes but we decided to stick to our favorites. 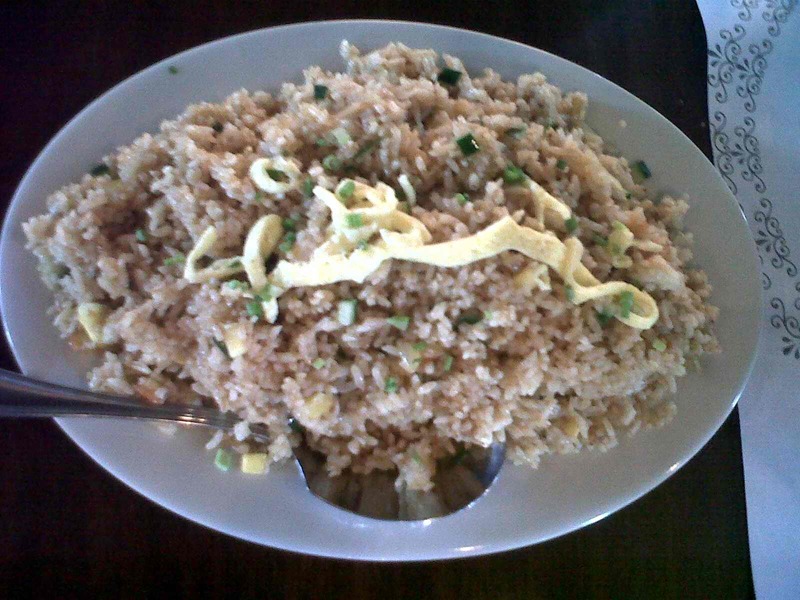 There were 5 of us and we ordered Bagoong Rice and Seafood Rice. When it was served, we were actually thinking that we didn't have to order anything else because it was good as a meal in itself! 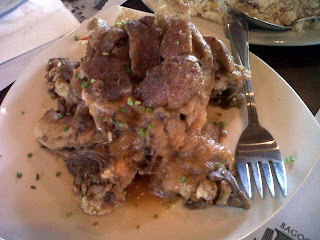 The above dish is Crispy Pata Binagoongan. It was too much for 5 people and we had left overs. If I was eating it at home, the dogs would hate me cause there wont be anything left, he he. 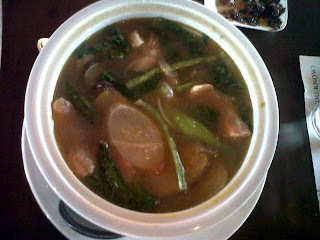 And this is Sinigang na Salmon Belly sa Miso at Bagoong. I found it too salty, but they loved it. Maybe its just me. But I love the fish, just not the soup. 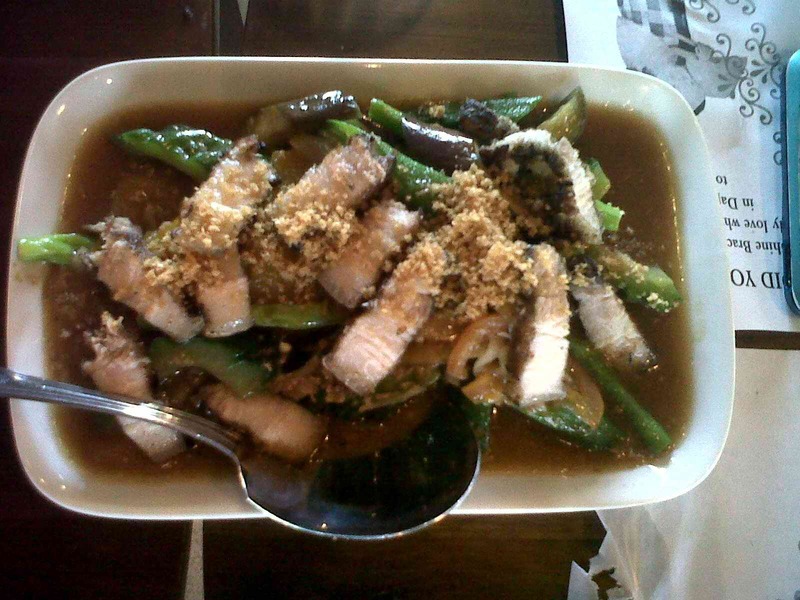 And this was my favorite, the Pinakbet at Liempo Barbecue. I love how the veggies were cooked just right. The food was great and so was the ambiance. There were only few diners and service was great too. The waiters were very attentive and although the food was not served as fast as I would want to, the appetizer made up for the wait. At P900, the food was more than enough for the 5 of us. It was really a great deal! And if you are going to ask if we are coming back even if we don't have vouchers, indeed we will! PS. Sorry for the quality of the pictures as we only have cam phones with us! May dalawang dekada na namayapa ang aking ama. Nasa mataas na paaralan pa lamang ako ng siya ay pumanaw. Pero hanggang ngayon ay tanda ko pa ang mga masasayang alaala namin dahil alam ko, ako ang kanyang paborito. Nalulungkot lamang ako na sa sementeryo na lamang, sa ilalim ng lapida, siya nakilala ng aking asawa at mga anak. Pero hindi ako magkukulang ng pagpapaalala sa kanila tungkol sa aking dakilang ama. At bagama't ngayon lamang kami uli nakauwi ng Batangas para dumalaw sa kanyang puntod, isa naman itong masayang panahon ng pag-alala at pagdarasal para sa kanya. 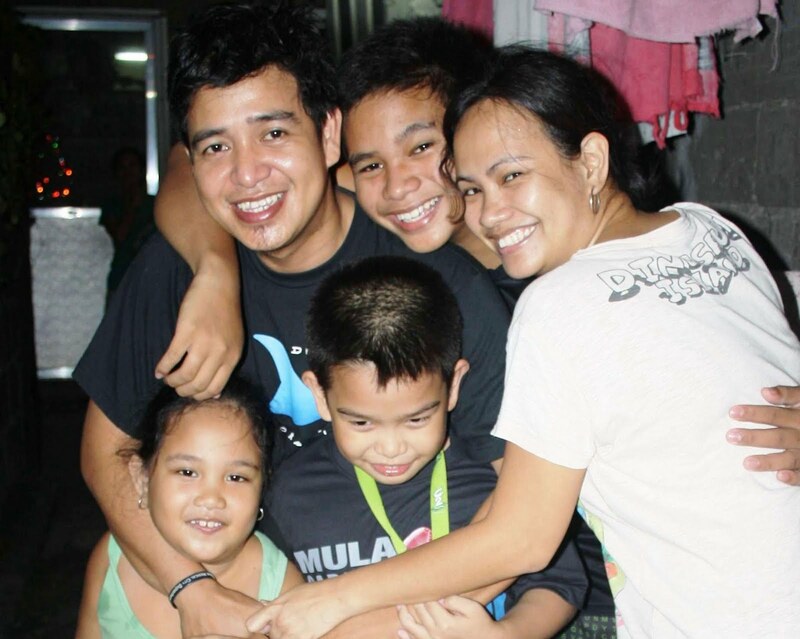 At nasaan man siya ngayon, alam kong masaya siya para sa aming naging pamilya. "Being happy does not mean that everything is perfect. It means that you have decided to look beyond the imperfections." 1. Going home to Batangas after three years for All Souls Day and visiting my father's grave. 2. A fun and exciting road trip, complete with food stop, trick or treat on the road and water stop to avoid over heating our van, ha ha! 3. 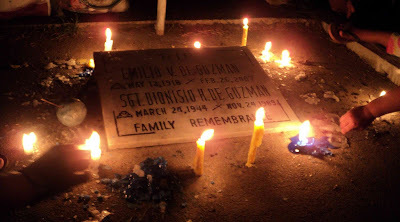 A short visit to my tearful maternal lola who cant stop gushing over me and my sister and our husbands and the kids. We saw her earlier this year, but I guess she is just getting old. 4. A swatch watch, a corned beef, Jergens lotion and soap from my Tita Tess, whose engineer husband was home from a vacation. Loot galore! 5. Learning how to make suman and eating all you can too, he he. Will post pictures and how-to soon! 6. 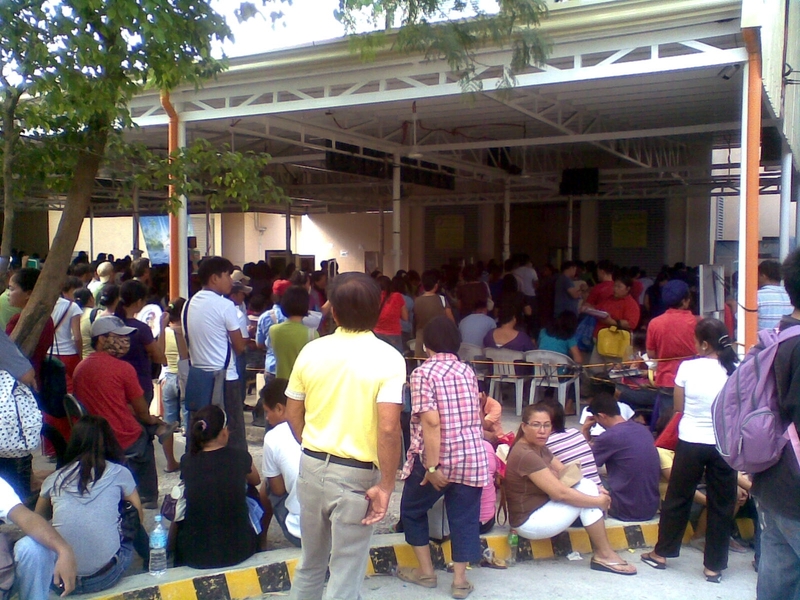 Being serenaded by "mga nangangaluluwa." 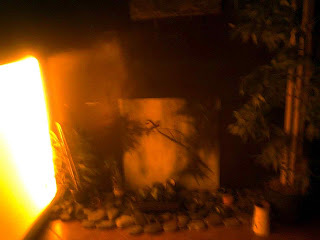 No, we were not being haunted! It is a common custom in Batangas during the Halloween season. More like Christmas carolers during Halloween. 7. Seeing some cousins after a long time and catching up on life and happenings. 8. A buffet lunch from an 85th birthday party celebration. 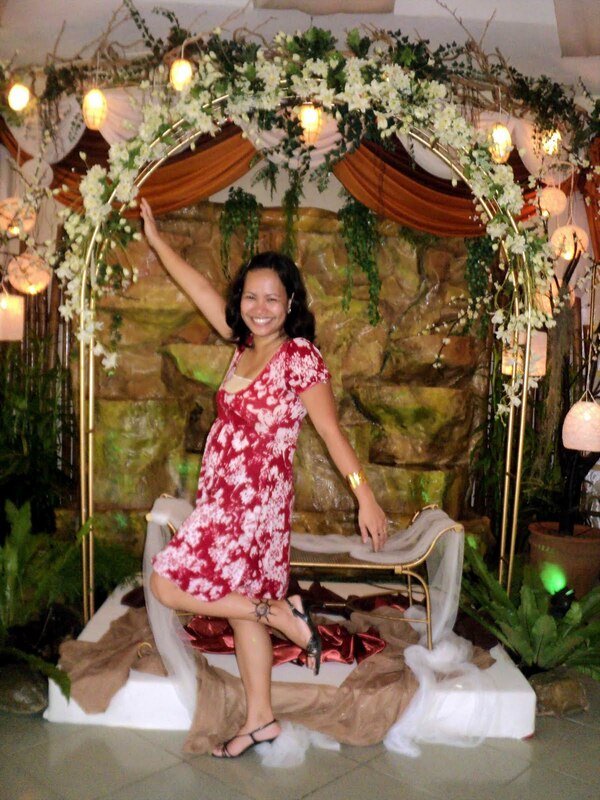 Nothing beats a Batangas celebration! 9. Eating and gaining 8 lbs! 10. A new personal goal to lose that 8 lbs before the end of the month and hopefully rewarding myself with hair rebond if I do! Good luck to me!